You’re always trying to help your kids stay healthy, and sometimes they need a little help. So we’ll help you find the best probiotic for kids. It’s important to remember that, while we are invested in learning about probiotics and their benefits, we are not doctors. We, therefore, cannot speak to any health-related claims or tell you that probiotics can treat or cure anything. That’s between you and your pediatrician. Type: Choosing a type of probiotic can be different based on your child's needs. If your child doesn’t like swallowing pills, consider a gummy or tablet. If your child's sensitive to taste and will not like a gummy flavor, consider a small pill. 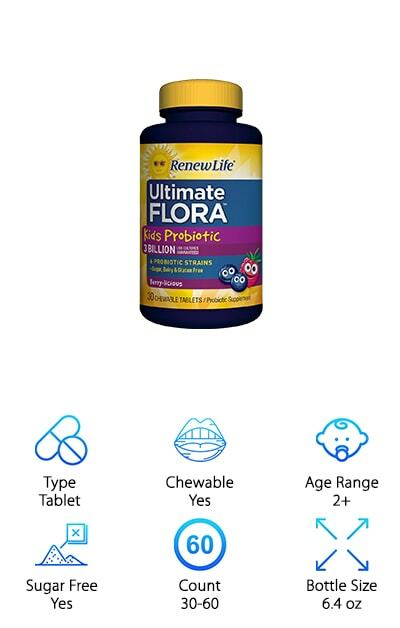 Chewable: This is a great feature in children's medicine, as many kids don’t like swallowing pills or taking supplements. Hiding the good stuff in a sweet and chewable tablet or gummy can help make vitamin time a little easier. Age Range: Some probiotics and supplement should only be used for certain age ranges, so pay close attention to this if your children are especially young. Some kids can also switch to the adult supplements at a certain point, so keep an eye out for that. Sugar Free: You don’t want your kids getting anything extra with their probiotic. Choosing a supplement that is sugar-free ensures that they only get what they need, a great probiotic, and nothing else. Count: How many come in a package or bottle is important when considering the overall cost of giving probiotics to your whole family. Consider also the dosage, so you’ll know exactly how much you’ll get out of a bottle. Bottle Size: The bottle size is important to consider when thinking about how this probiotic will fit into your routine. A smaller bottle or packets will be easier to carry on the go, while a larger bottle is great for taking supplements at home. So now that you know what to look for, let’s get ready to choose a great probiotic. We’ve assembled some really great picks for the most effective probiotic supplement. Our top pick is the best of the best, so start there. Our budget pick is up next, for people who want to get a great probiotic without the price tag. Check out all of our picks though, as they are all great choices. What is the best probiotic on the market? This is a question that plagues many people searching for a probiotic solution that works for them. The question only amplifies when you’re shopping for your kids, as you want them to have the absolute best of everything. In our guide, PRO-Kids Children's Probiotics takes that title. The small, pearl-sized pill is easy to swallow for as young as four years old. This probiotic contains four targeted strains, including Lactobacillus and Bifidobacterium. It has 3 billion colony forming units per BIO-tract pearl, making it a great choice for people looking for a probiotic that really packs a punch. The best part about this formula is that kids only have to take it once per day, making it an easy thing to work into their morning routine. These pearls are natural and sugar-free, ensuring that your child isn’t getting any more of that unnatural material from their probiotic. It’s even made right here in the USA. 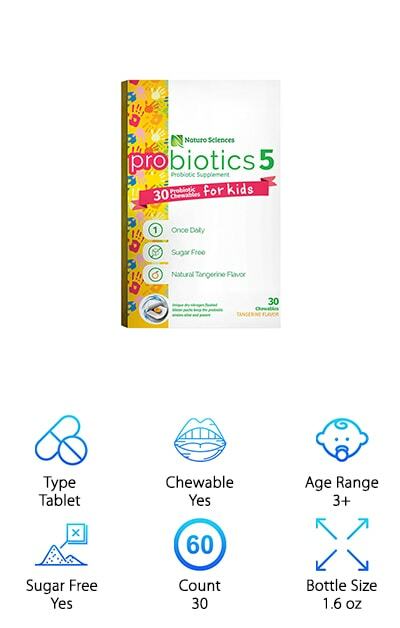 Our budget pick is a great choice for anyone who wants their kids to take probiotics but needs to stay within their budget. This kid's chewable tablet is from one of the most popular probiotic brands: Renew Life. These berry flavored gummies are sure to have your kids craving their vitamins every morning. The gummies are tasty and fun to eat, making getting them to take their probiotics a fun and simple task. This probiotic has six strains, just to make sure all their bases are covered. It’s also sugar, dairy, and gluten-free, making it safe for even sensitive tummies. It even leaves out artificial flavors and colors, creating something that is safe and fun for kids to eat. This pack contains 30 chewy tablets that have your kids asking for more. This probiotic contains 3 billion live cultures, allowing you to be sure your probiotic is brimming with goodness. 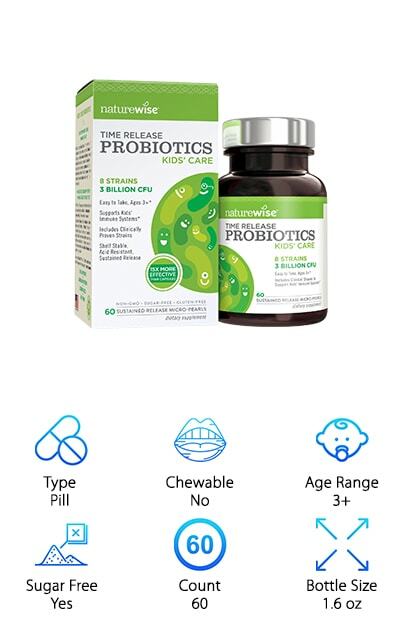 These probiotics are a great choice for someone looking for a probiotic with lots of different probiotic strains. This one contains Lactobacillus acidophilus LA-14, Bifidobacterium lactis BI-04, Lactobacillus plantarum LP-115, Lactobacillus salivarius LS-33, Lactobacillus paracasei LPC-37, Lactobacillus rhamnosus GG, Lactobacillus casei LC-11, and Bifidobacterium long BI-05. Those strains really help this kid-friendly probiotic pack a punch. This also comes with a prebiotic blend of Larch tree fiber, Gum Acacia, and Chicory Inulin. This easy to chew tablet has a natural orange flavor. The formula is sugar-free, so you won’t have to worry about harming your child's teeth in the process. You only need to give this yummy tablet to your child once a day, making it great for fussy eaters or stressed out moms. The tablets are packaged in individual blister foil packs that use a special form of dry nitrogen that keeps cultures fresh without refrigeration. This makes them easy to take with you no matter where you go. They are great for busy or frequently traveling families. Looking for the best probiotic available for babies and young children? 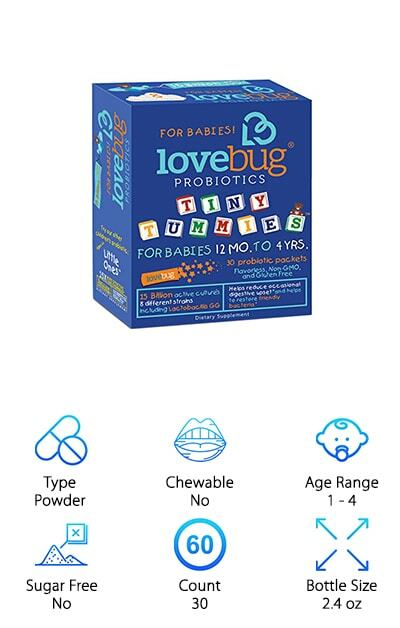 Tiny Tummies LoveBug Probiotics is the answer to your prayers. This nutritional powder is a great way to get even your youngest children enjoying probiotics. 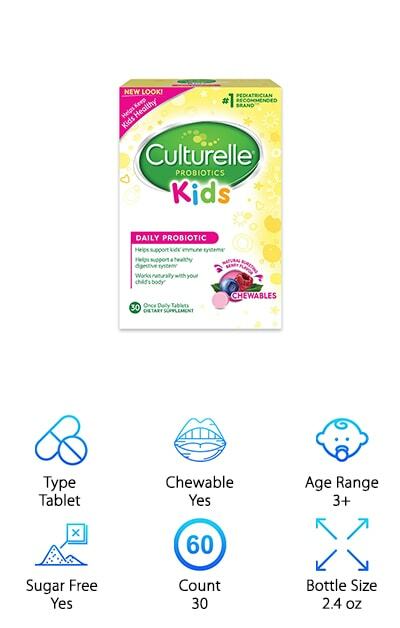 Each packet contains 15 billion live cultures, allowing your child to get the maximum amount of amazing probiotic benefit. The powder is flavorless, non-GMO & gluten free, so you won't have to worry about it interfering with your child’s sensitive tummy. It contains eight active strains of probiotic, so you’ll know your child is getting the best. These strains include Lactobacillus GG. These packets are easy to administer to your child. It can be mixed in with any cold food or milk you give them throughout the day, and they won’t even notice it’s there. These packets also do not need to be refrigerated, just store the packets in a cool and dry place. This makes them perfect for really busy families and for traveling. This probiotic is a great choice for parents of kids who are crazy about berries. This probiotic comes in a tasty chewable tablet that’s bursting with berry flavor. This makes taking their vitamins a fun and exciting activity for your kids, not a chore. This tablet is a great choice for children between 25-100 pounds, making it a great option for most young kids. This chewable tablet is sugar, dairy, and gluten-free. This means you won’t have to feel bad about adding anything unnecessary to your child's diet in order to get them a probiotic. You can also rest easy if you have a child with dairy or gluten intolerances, knowing that the probiotic you give them doesn’t contain those things. This probiotic has Lactobacillus GG as one of its strains. This strain is naturally sourced, meaning you don’t have to worry about your kids getting anything unwanted with their probiotics. This probiotic pearl is easy to take and a great choice for kids ages three and up. 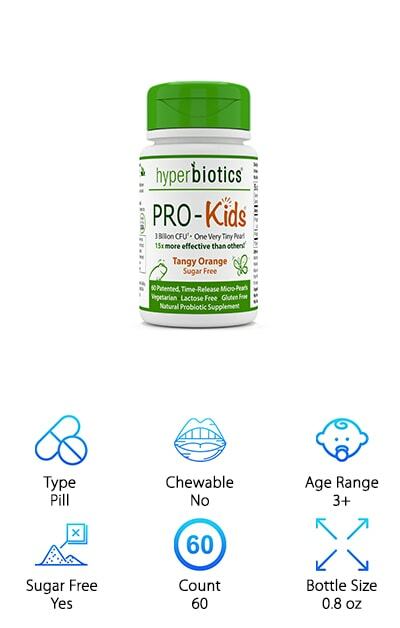 It’s a great option for kids who don’t like the taste of chewables but still need their probiotics. This tiny “pearl” pill is easy to take and makes vitamin time a no-brainer. It can even be hidden easily in food for fussy pill takers. This probiotic contains eight strains of good bacteria. It comes with 3 Billion CFU packed into every tiny pearl. This product is non-GMO, so it’s safe for your child. IT is also sugar and gluten free, ensuring that your child doesn’t receive anything extra with their probiotic. This makes it a great choice for children with fussy tummies. This probiotic is even shelf stable, making it a great choice for families on the go who can’t constantly refrigerate their probiotics. The micro-pearl capsule has a sustained release formula that ensures your child is receiving their probiotics throughout the day. This probiotic is a great choice for people looking for a lot of CFU in their probiotic. It comes with 5 billion of them in every tablet, providing a great once daily source of probiotics. This supplement contains Lactobacillus acidophilus and Bifidobacterium. It also contains fourteen different probiotic strains, to ensure your child is getting everything it needs. This supplement even comes with vitamins C and D included, making it a great choice for your child to get more of the vitamins it needs. It is perfect for families looking for a one and done probiotic. The organic cherry berry flavor makes it something your child will love to eat, not something they will dread with their breakfast. It comes with a shelf-stable bottle that allows you to store this probiotic outside of the fridge. This formula also includes prebiotic fiber. It has no sugar, meaning your children are getting all-natural taste, nothing artificial. These gummies are a sweet way for your kids to get their probiotics. The delicious natural fruit flavors will leave your kids wanting more. 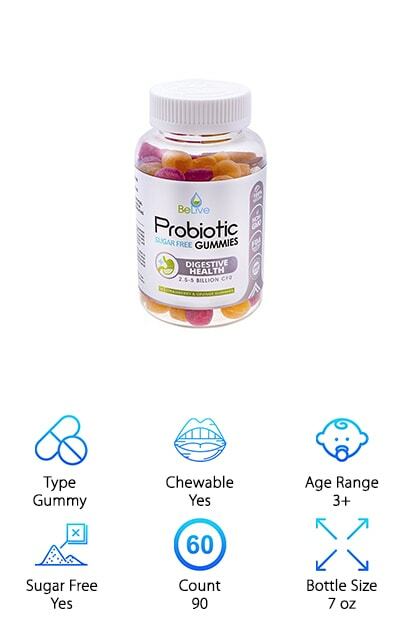 If you’re searching through probiotic for kids reviews looking for a great gummy, you’ve found it. This gummy is great for your kids through and through, with no artificial flavors or colors. This makes giving your kids their probiotics a guilt-free experience, as well as a fun one for your kids. The recommended dose of this gummy is two daily, so keep that in mind when you get excited about the big bottle size. 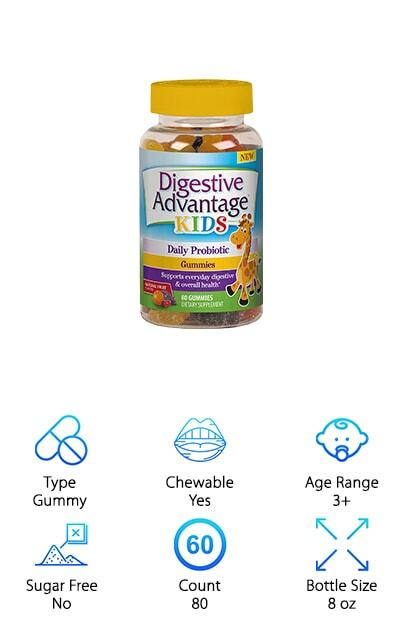 Digestive Advantage advises that your child takes two gummies daily, at two different times a day. This means double the fruity fun, with a taste they’ll love. This is a great choice for people who are looking for a sweet and fruity gummy to help their kids take probiotics. It’s a great choice for kids who already love gummies. Still wondering which probiotic is best? 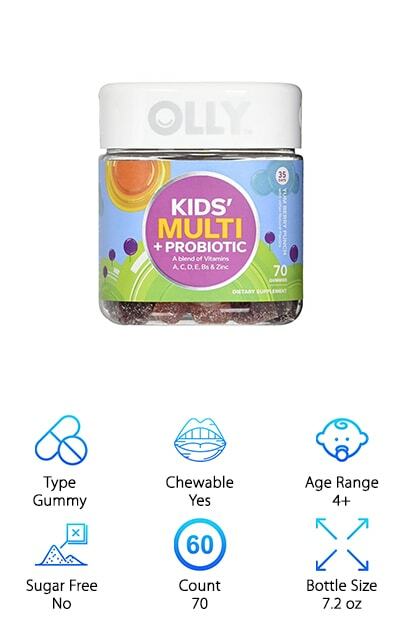 The OLLY Kids Probiotic may be the one or you then. If you want your probiotic to do it all, this is the one for you. In addition to probiotics, it contains a blend of vitamins A, C, D, E, Bs & Zinc. This makes it a great all in one vitamin and probiotic, so you won’t have to worry about keeping track of multiple gummies or products. The fruit punch and berry blast flavors make this a vitamin your kids will love to take. It comes with 70 gummies in every package, so this awesome vitamin will last you a long time. It’s made with natural colors and flavors, so you won’t worry about anything extra getting in your child's supplement. The gummies are lightly sweetened by their natural flavors, so kids will love their sweet taste. These gummies harness the power of plant-sourced phytonutrients and antioxidants to give them a great punch. 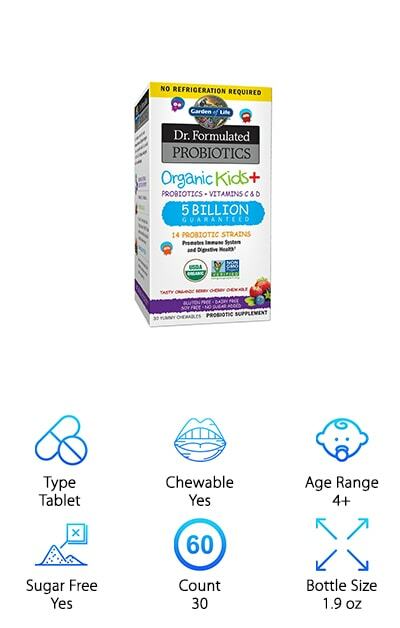 These probiotics are perfect for parents with older children who just want to buy one probiotic. This formula is a great choice for both kids and adults, with 2.5-5 billion CFU per gummy. These gummies are sugar-free and incredibly tasty, making them a great choice for both children and adults. This probiotic is made with Bacillus Coagulans. These gummies are heat resistant and store well on the shelf. No more babying your probiotics in the fridge. These gummies can be taken once a day with a meal, making them the perfect after breakfast treat. The tasty strawberry and orange gummies will have everyone craving their probiotics instead of dreading them. These gummies are even easier to pack in a lunchbox for a healthy after lunch snack. BeLieve Probiotic is a great choice for families who want to take their probiotics as a team. Everyone will love their candy-like appearance and great taste.